Dec. 11, 2017 5:38 p.m.
A Port Renfrew business that was soon to be opening as a hostel and adventure centre went down in flames early Saturday morning. At approximately 5 a.m., Port Renfrew Fire Rescue responded to a call from an employee who was staying in the staff housing beside the property, saying the building had caught fire. 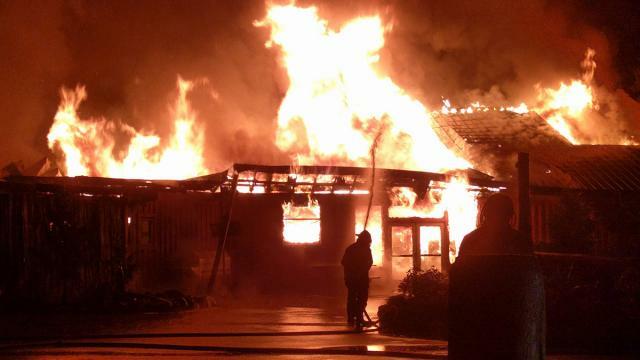 Mike Hicks, Capital Regional District director for the Juan de Fuca Electoral Area, said by the time the fire rescue arrived at the scene, the wooden building was engulfed in 50 to 60-foot-high flames. Firefighters, as well as some members of the community, worked until noon the next day to contain the fire. Jack Julseth from Three Point Properties, who owns the property with a few family members, said he was happy that no one was hurt, and that no other properties were damaged. The building, which was formerly known as the old Lighthouse Pub, was set to open in May as a retail centre in addition to the other adventure businesses in town owned by the same family. He said the building was a lovely asset to their “master plan” but luckily it was not their main focus and now they will just use temporary facilities until that one is replaced. “The last thing I want is anyone thinking we aren’t operational. We are still open, this is just a bump in the road,” Julseth said. The fire finally smouldered out at approximately 5 pm the next day, and inspectors say it was likely caused by an electrical shortage.